On a recent hiking trip with the pups, I sported this dog travel pack from VIP Products. 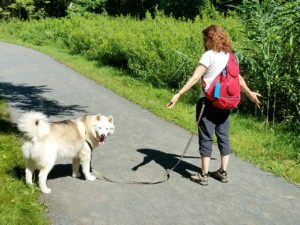 On a five-mile hike on a hot summer morning, it proved very useful to conveniently carry enough water, snacks and all the accessories for three dogs and two people. When the pack arrived it was much larger than I thought and far more durable than I had expected. It actually has some heft to it, when it is completely empty. The material is heavy duty and well stitched. I was impressed with the workmanship. The bright red color of the pack is cheery and vibrant. It is the equivalent of a diaper bag for dogs, carrying everything necessary while on the road, to keep dogs comfortable, safe and happy. And unlike most diaper bags, it has a modern, outdoorsy style that suits me. The accessories are well thought out and very useful – some more than others, as I will detail below. This bag has a lot going on for a pet parent’s needs and I was eager to try it out in the wild. Two folding bowls for water or food zip on and off, conveniently located on the exterior of the pack. I will never forget my fold-a-bowls again! Having two bowls was of great use to me because I have three dogs and one (Lobo…) is a water hog who doesn’t like to share. Fiona and Secret could easily share the other bowl together as the bowl is quite large. 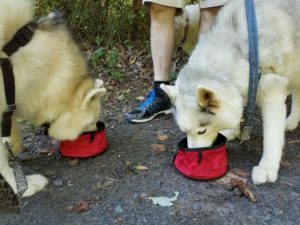 Of course the two bowls can also serve for separate water and food bowls as well, when traveling with your pets. The carabiner on the bottom left side of the pack came in handy to attach the leash for hands free walking. 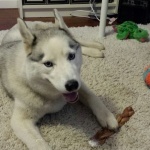 Our dogs are not as obedient as some and being huskies, have a tendency to drag us along, despite the extensive dog training that we have gone through together. After walking Lobo for a while however, he was tired and not pulling as much; I hooked him to the carabiner, leaving me hands free to walk along, clean up poop, dispense water or treats, etc. I felt more relaxed and less harried. Sometimes wrangling dogs is work, although I do love every minute of it. The water bladder is well positioned for people as it is much like a camel back one uses for cycling; it also of course works well for dogs. I threaded the hose out of its channel along the strap and let it hang down below me so gravity would help fill the dogs’ water bowls. Luckily I had brought along two additional bottles of water as the water bladder was soon emptied. Our 5-mile hike was lengthy and with three thirsty dogs, required far more water than the water bladder could hold. The water bladder zips into a handy detachable pouch on the bottom of the pack; it can also be worn on its own around the waist. The padded shoulder strap features a detachable cell phone pocket. Quite convenient to keep the phone safe and easy to locate, although a tight fit for my large smart phone in a case. Poop bags fit in a handy exterior pocket with an opening for easy dispensing. Quite nice! Never forget your waste bags again. And no more fumbling around in a larger bag, trying to find them. The interior of the bag is very spacious and could easily hold two large bottles of water, bug spray, snacks, car keys, wallet, eye glasses, and a bottle of Gatorade for the peeps. I found myself wanting a separate interior pocket for small things like keys, but there are also several outside pockets for that. Overall this bag is quite a find. I like knowing that I have all the things I need for the pups in one easy to use bag. They now get excited whenever they see me taking it out, as they know what it means – adventure time! Available online at The Paw Is Mightier.